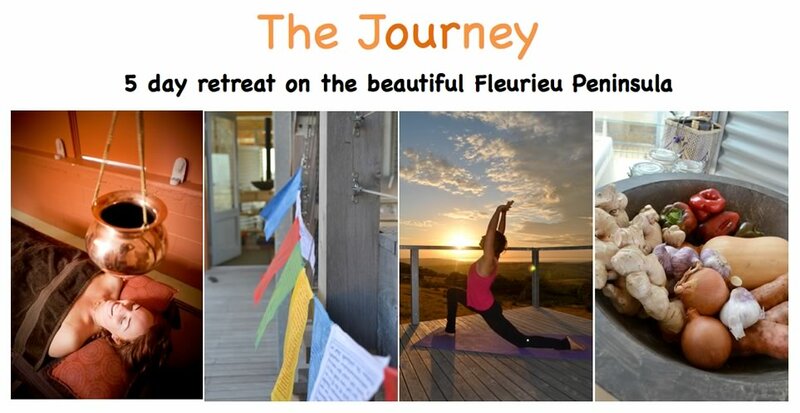 Join Julie, Tan and Sarah for a weekend of Self-care and Sacred Intentions. Creating space for yourself to gently and deeply go within through Yoga, Meditation, walks in nature and healing body treatments allow your light force energy to flow freely, to clear, love and nurture your body, mind and soul. organise a group holiday house close to the studio if needed. Extra treatments are available at add on cost. 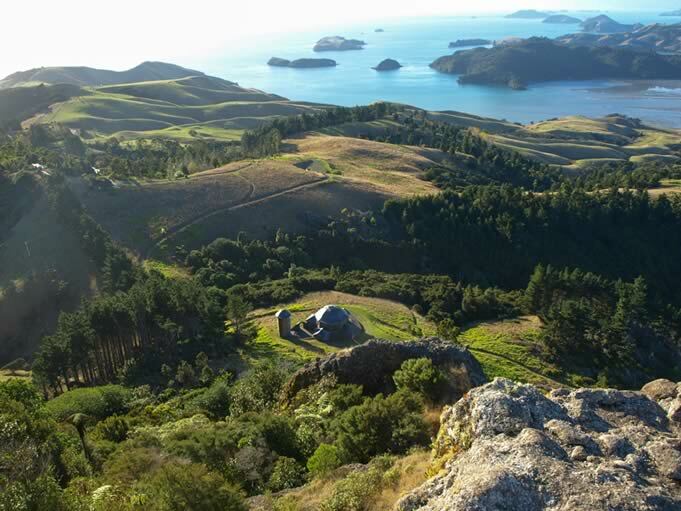 We are heading to the stunning Coromandel Peninsula where you will have the opportunity to ‘Journey to your Soul’. Tap into the power of the light of your soul, allow it to shift, release and clear blockages and unwanted emotions & perceptions, find inner peace and resonance with your higher self. Julie Sexton and Sandra Caballero will guide you on this path through yoga, meditations, mindfulness, pranayama and a 30min. Intuitive Vibrational Healing Session. 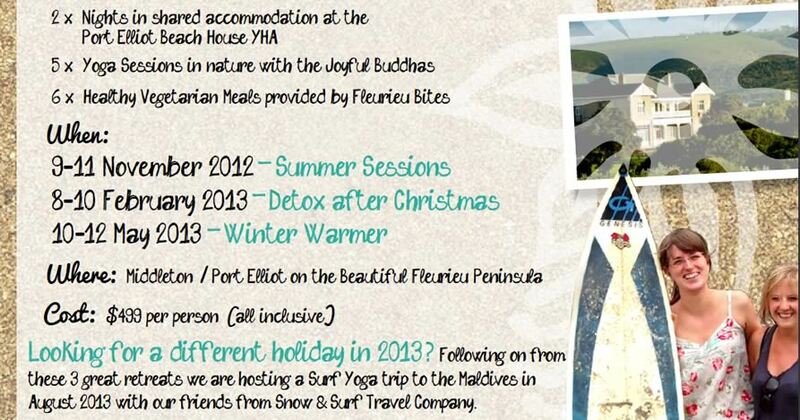 The Retreat will provide us with organic vegetarian meals daily and twin share accommodation. We will have free access to their sauna and not included in the cost but available massages and other healing modalities. 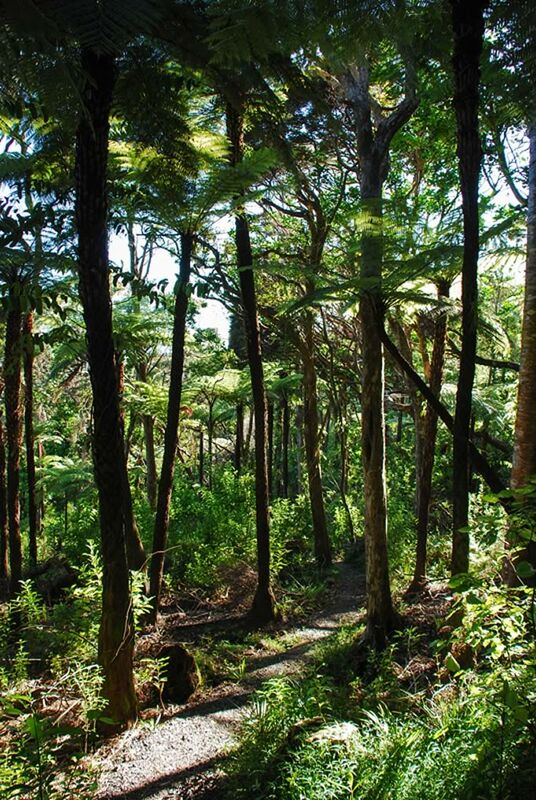 There will be free time for bush walks and to explore this beautiful area of New Zealand. All meals x 5 days, plus 30 minute Healing Session. Turn inward to find serenity and wisdom through your own spiritual pilgrimage to old Japan. Slow your pace deep in the mountains and in heritage sites in Saitama and Kyoto through connecting with Japan's ancient earth, healing energies of natural hot spring baths rejuvenating mind and body, daily yoga practice, daily seated and wilderness walking meditations, Buddhist teachings, sutras, energy healings and mind empowerment sessions. Embrace the traditional cuisine, culture, knowledge and experience of resident monk in Saitama and enhance your spiritual development while embracing your human self and connection with the pristine natural environment. Enjoy the ease and comfort of a bullet train to Kyoto to further immerse yourself in the culture and traditions of old Japan whilst deepening your own spiritual experiences through daily yoga and meditation practice and your own inner-journey. A temple stay, (Shukubo), will bring you close to Japan and its culture. The tranquility and beautiful scenery of Taiyoji (Temple in the Sky), together with the spiritual environment, will create an unforgettable experience. The isolated temple is perched on a mountainside high above a river valley, providing an astounding view of the Mitsumine (‘three peaks’) mountains of Chichibu-Tama-Kai National Park. With no houses or buildings nearby, Taiyoji Temple has always offered temple lodgings, initially to pilgrims seeking solitude and inner peace. Even today there is no TV or cell/mobile phone reception. Instead you will hear the birds and the sound of the clear streams. Looking up from the outside bath, you will enjoy nature's blessings and a wonderful starry sky. In this place, far removed from the 21st century yet conveniently close to Tokyo, you can let go of worldly affairs. 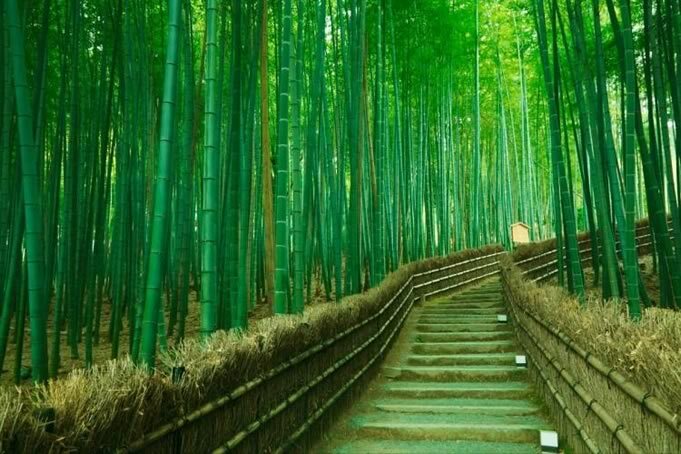 'Learn from nature, let nature teach you;' is the concept that has been taught in Zen for over 700 years and that they continue to teach at Taiyoji. Shunkōinji Temple (Temple of the Ray of Spring Ray) is a sub-temple in the Myōshinji temple complex (near Ryoanji Temple, the Golden Pavilion, and Ninaji Temple) in Kyoto, Japan. The temple was established in 1590 by Yoshiharu Horio, who was a feudal lord, or daimyō, of Matsue in present-day Shimane Prefecture. Because the temple is located in the center of the biggest temple complex in Kyoto, you can enjoy peace and silence, even though you are still inside of Kyoto City. This temple houses important historical objects that reflect the multifaceted religious and artistic atmosphere in Japan from the sixteenth century onward. Shunkōin not only offers visitors an opportunity to learn about Rinzai Zen Buddhism, but also to see valuable objects representative of important epochs in Japanese history. The temple is also located near Ryōanji Temple, which is famous for its Zen rock garden, and Ninnaji Temple. Both temple are designated as UNESCO World Heritage sites and 10 minutes away from Shunkoin Temple on foot. Most meals are included in the retreat and the meals that are prepared in the Buddhist temple (Shojin Ryori) are traditionally vegetarian or vegan. Some days you will have the opportunity to purchase and experience a variety of Japanese or other cuisine. Price and inclusions: Retreat cost is $2,800. Deposit it $700 (25% of retreat cost) to secure your booking. The remaining amount should be paid 60 days before arrival. Deposit and payments are non-refundable. 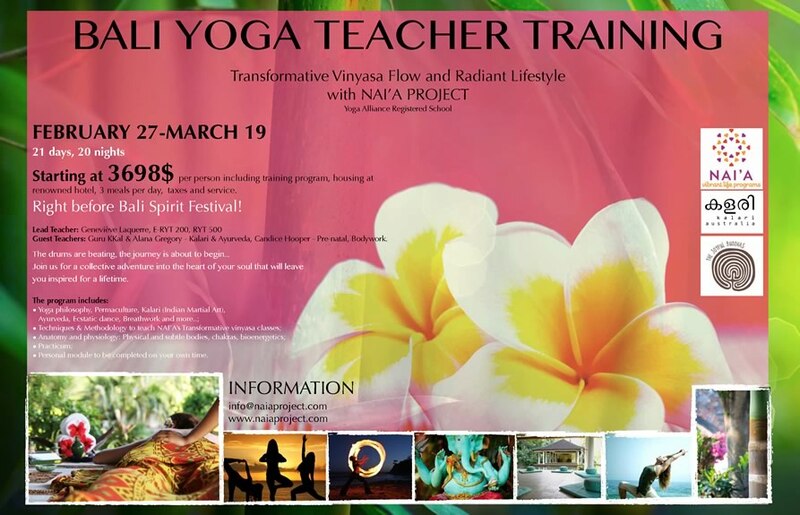 All activities are optional and suitable for all levels, beginners to advanced, with no experience in any activity necessary to gain optimum result from retreat. You may like to contact us to discuss greeting and guide to the first location and guidance for departure after the second location. Our group will predominately be arriving at Haneda airport, near Tokyo. If you are arriving from a different terminal (such as Narita airport), please contact us to assist you in reaching Taiyoji temple in time with the group. We will communicate with you directly and answer any questions you have about the retreat. Please contact us to provide us with your contact details. It is a policy in Japan to provide accommodation providers with passport details of passports. Some countries have passport restrictions and it is important to check with your travel agent or immigration center prior booking your retreat. Australian citizens with an Australian passport do not need a visa to enter Japan for tourist related activities and the fees are included in the airfare. Expand and deepen your yoga practice through aligning with our natural environment. 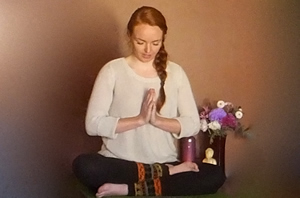 Immerse yourself in plant oils and aromas to nurture, cultivate, brighten and deepen awareness with a series of flowing poses and corresponding meditations, honouring interconnectedness and Earth’s gifts. 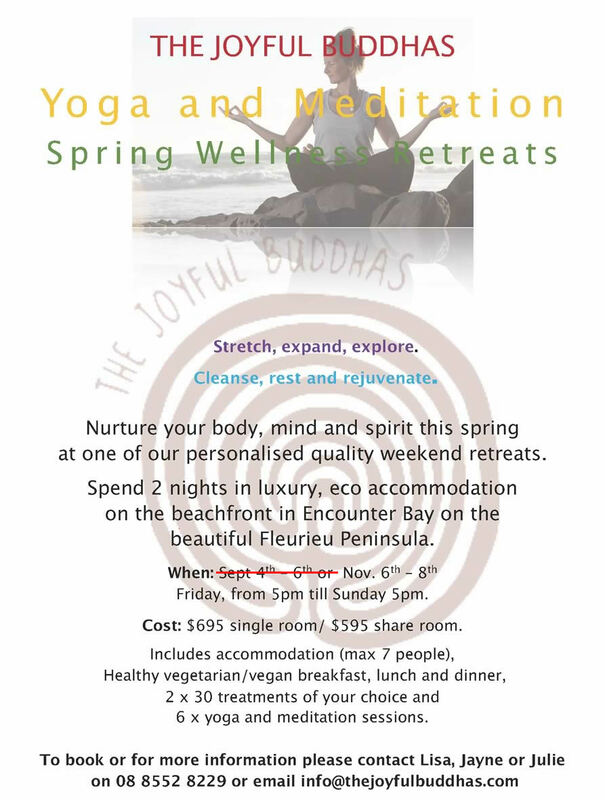 Perfect for a Corporate Wellness retreat, couples, friends or individuals seeking deeper connection with self, others and our beautiful environment. 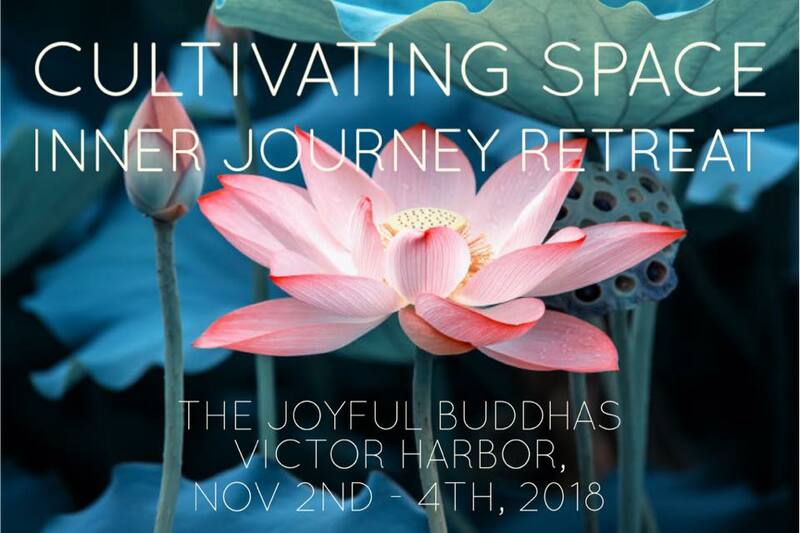 Join Julie, Heather and Jen for 3 nights of connecting with your deeper true self. Quiet your mind, release stress, stretch and relax your body, nurture yourself let go of negatives and open your heart to feeling peace, love and joy. $200 deposit to be paid to secure booking and balance to be paid by 22nd June. Delve deep within, replenish & harmonise your body, mind and spirit at our 3night retreat in luxury beachfront accommodation, May 18th -21st, 2017. Through, yoga, meditation, workshops and healthy vegan food cleanse your body, clear your mind and align with your higherself. 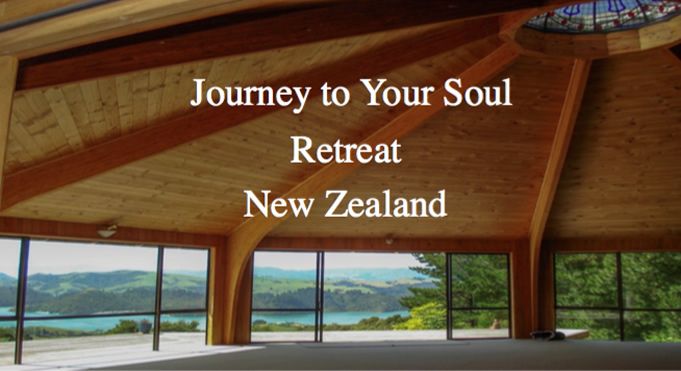 In this small personalised retreat we will guide you to clear energy blockages, patterns of thought that no longer serve and connect more deeply with your heart and potential. $200 deposit to be paid to secure booking and balance to be paid by 11th May. 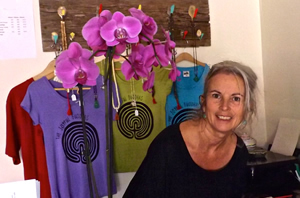 Join Julie and Diana on a personal & spiritual growth adventure, purifying your body, mind and soul through yoga, meditation and vegetarian food, guiding you to raise your vibration and connect with your higher self. The first part of this journey begins in Phnom Penh on Oct 2nd where we meet as a group and dine at ‘Romdeng Restaurant’. 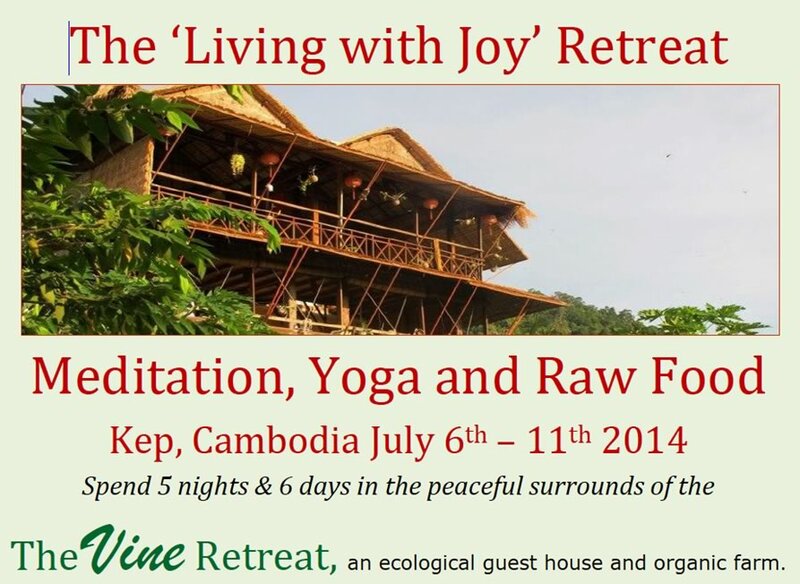 On the morning of the 3rd we will travel 3½hrs to Kep by minivan to our home for the next 5 nights, ‘The Vine Retreat’. 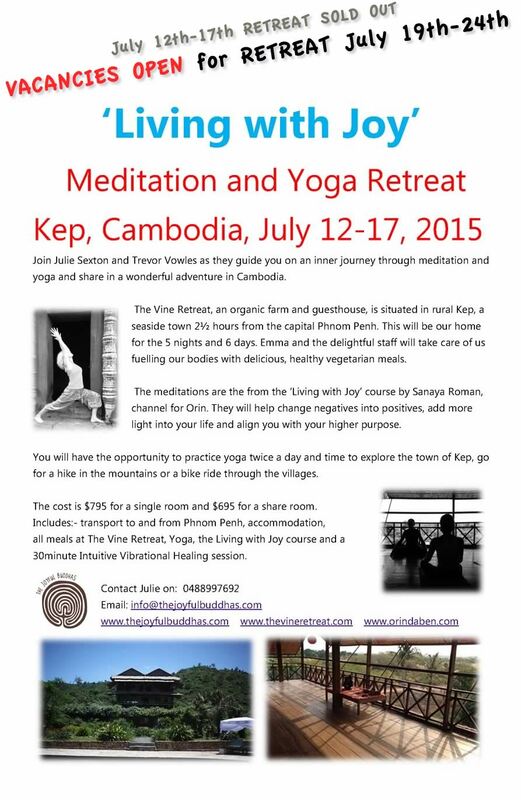 The Vine is set in rural Cambodia on a Pepper Plantation and organic farm with magnificent views of for miles. Julie & Diana will guide 2 yoga sessions and 2 meditation sessions daily and you will receive a 30 minute Intuitive Vibrational Session. We will explore the surrounding area by travelling into Kep for an afternoon, ride bikes into the local village and trek into the forest where will stop to enjoy the magnificent views to Vietnam. On the 6th day we will return to Phnom Penh for a night were you will have the option of leaving us there or joining on a second part of an adventure in Cambodia. 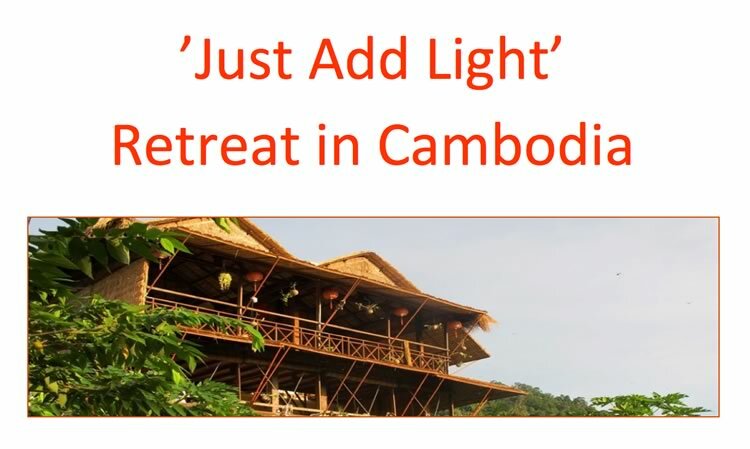 This journey we will travel to Siem Reap by bus or van and stay at the luxurious Navutu Dreams for 4 nights, partake in yoga and meditation daily, visit Angor Wat and the many experiences you can enjoy in this area. 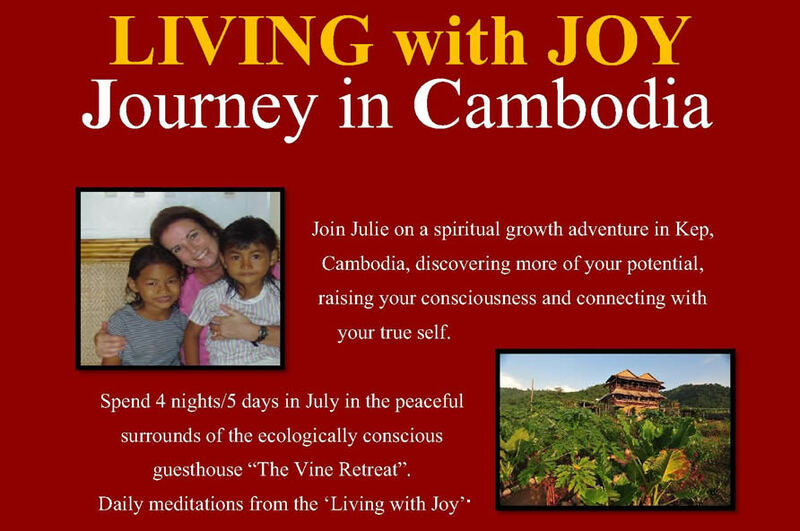 Includes accommodation, all meals @ The Vine, 2 x yoga & meditation sessions daily, a 30 min healing & transport to and from Phnom Penh. 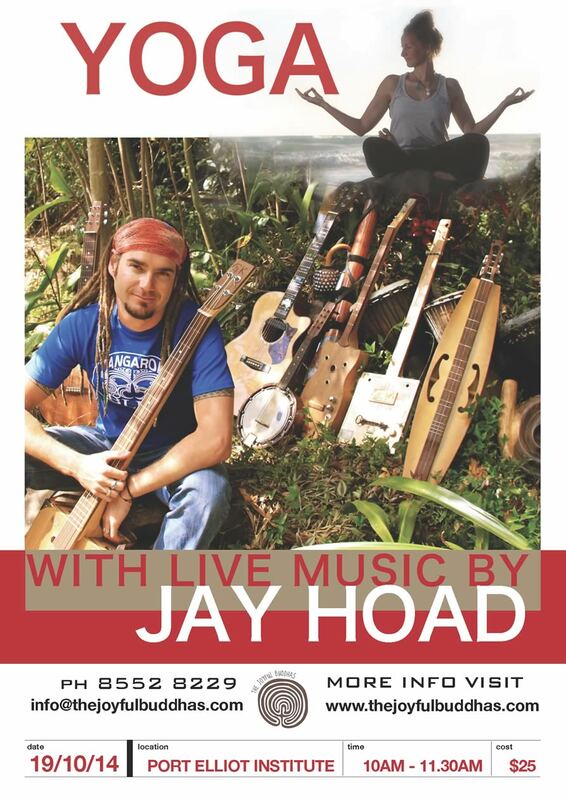 NOT INCLUDED – Airfares & accom & meals in Phnom Penh. 29th-31st August . Inman Valley . 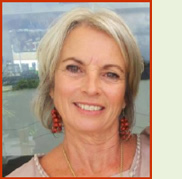 Join Julie Sexton on a spiritual growth & wellness adventure, cleansing and purifying your body, mind and soul, raising your consciousness, discovering more of your potential and connecting with your higher self. Daily meditations from Orin's 'Living with Joy' course, channelled by Sanaya Roman, will assist you to open your heart, change negatives into positives, increase your sense of aliveness and well-being and live in higher purpose. Click here to download flyer (PDF 464 KB). All profits will assist a Cambodian family to buy a house they can call home. Click Here for PHOTO GALLERY: Post by The Joyful Buddhas. 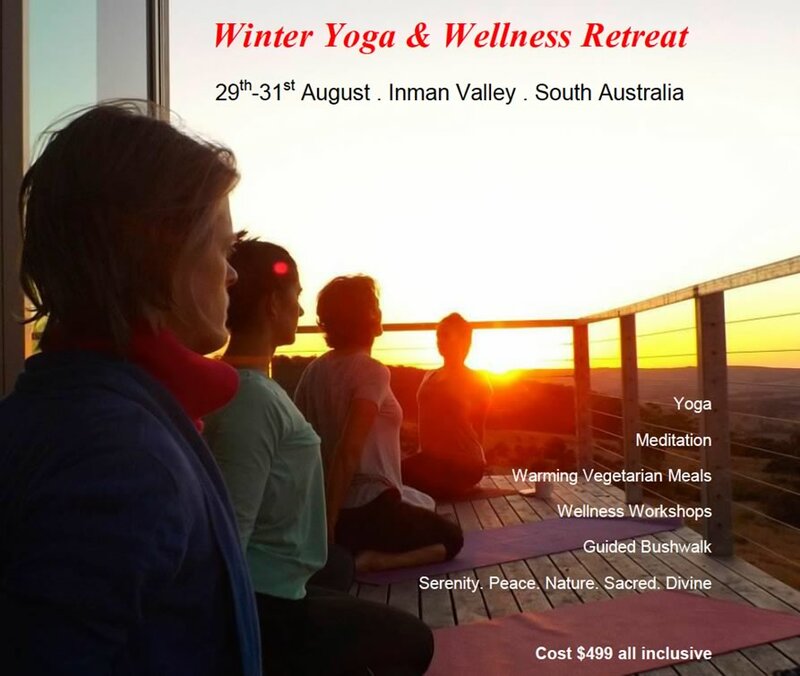 Immerse yourself in all things health & wellness as you surrender to the surroundings of untamed nature practicing the art of yoga with the Kangaroos, while the sun rises over the ocean. 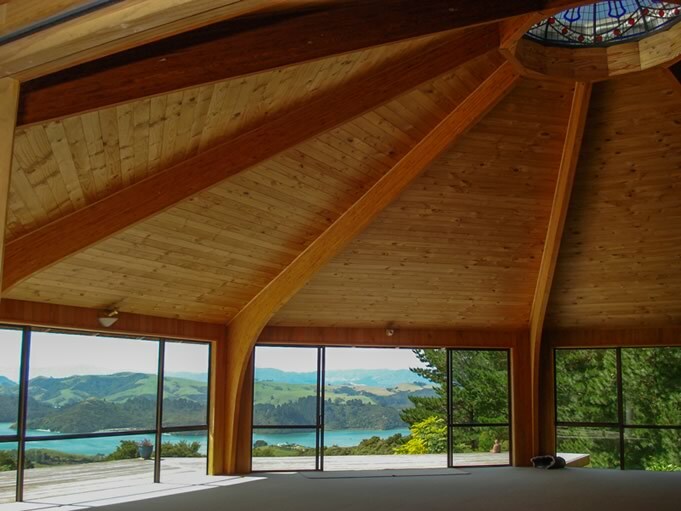 This retreat offers the perfect space to escape from the city and delve deep within. Cost includes accommodation, all yoga & meditation classes, guided bushwalk, gourmet vegetarian meals, cooking class and various workshops. Additional therapies such as massage, spiritual healing, reflexology and Ayurveda can be added at an extra cost. Begin the year happy, healthy and deeply at peace. 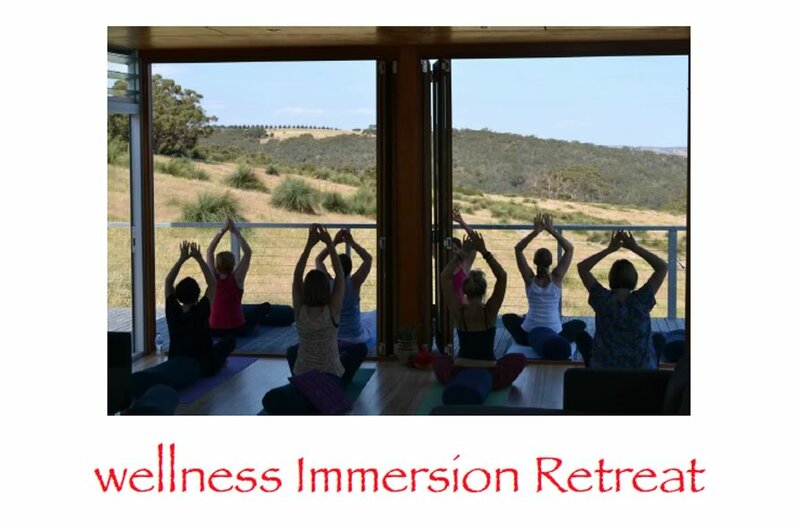 Held in the beautiful seaside town of Middleton in South Australia, this intimate retreat will allow you to submerge yourself in all things health & wellness. 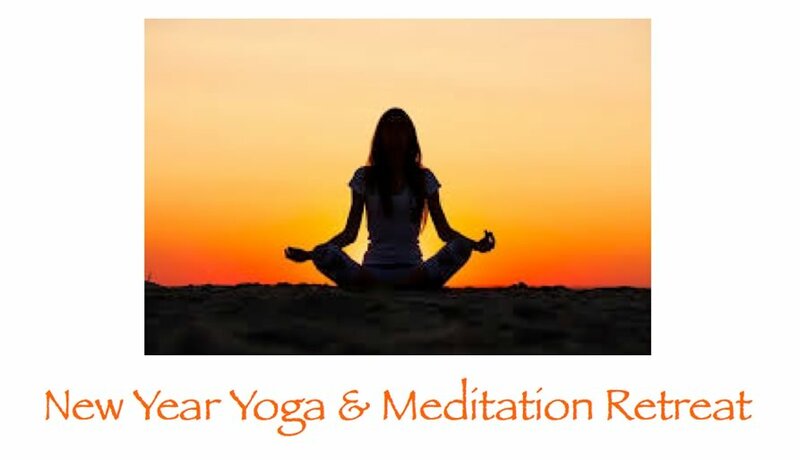 Surrender to the deep relaxation and healing tranquillity that comes from the practice of yoga and meditation and cleanse and heal body and mind with clean, fresh, wholesome foods and practices. cooking class, & Intuitive vibrational healing session. Additional therapies such as massage, reflexology, Ayurveda can be added at an extra cost. $499pp – includes private room with double bed. $399pp – for couples or friends willing to share double bed in private room. Starting at $3698 per person including training program, housing at renowned hotel, 3 meals per day, taxes and service. Right before Bali Spirit Festival! 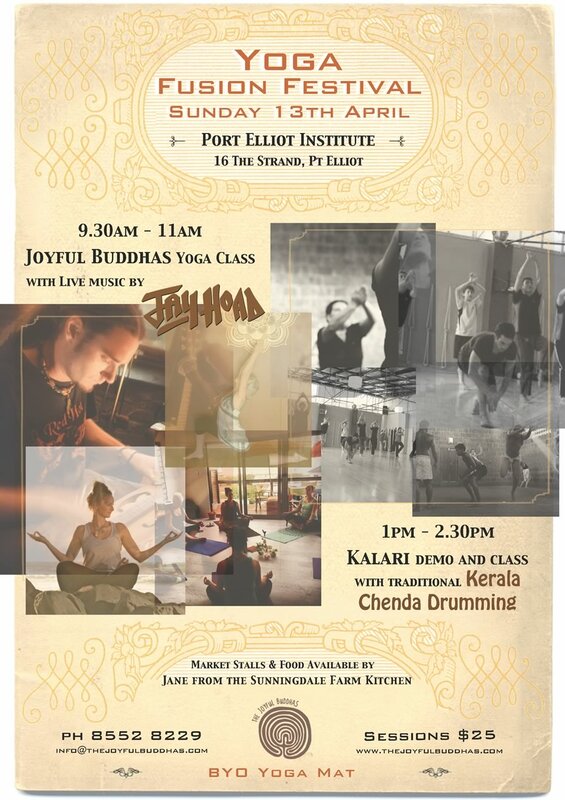 Guest Teachers: Guru KKal & Alana Gregory - Kalari & Ayurveda, Candice Hooper - Pre-natal, Bodywork. Join us for a collective adventure into the heart of your soul that will leave you inspired for a lifetime. • Personal module to be completed on your own time. create what you want without struggle and increase your sense of aliveness and well-being. Raising your vibration with L.OV.E. (laws of vibrational energy) and opening to the power of your light adds light to the world. 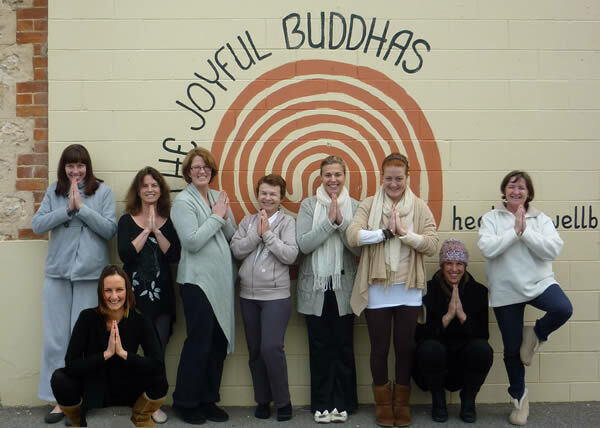 and the transformational 'Living With Joy' Course. Travel on a Journey within as you escape the hustle and bustle of the city and succumb to the beauty of the south coast of South Australia. 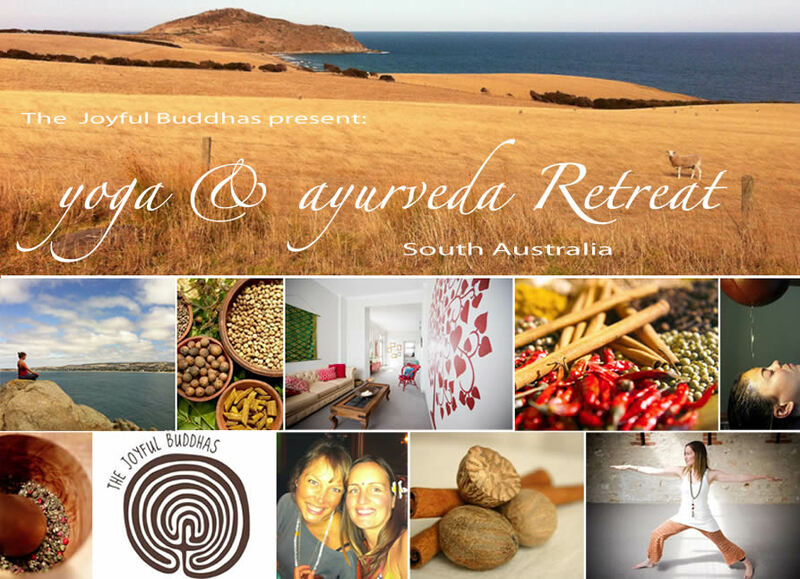 Set in the picturesque seaside town of Victor Harbor, you will totally immerse yourself in all things health & wellness. Begin each day with guided yoga followed by a healthy Ayurvedic breakfast. Living with Joy meditations will complete the holistic journey. 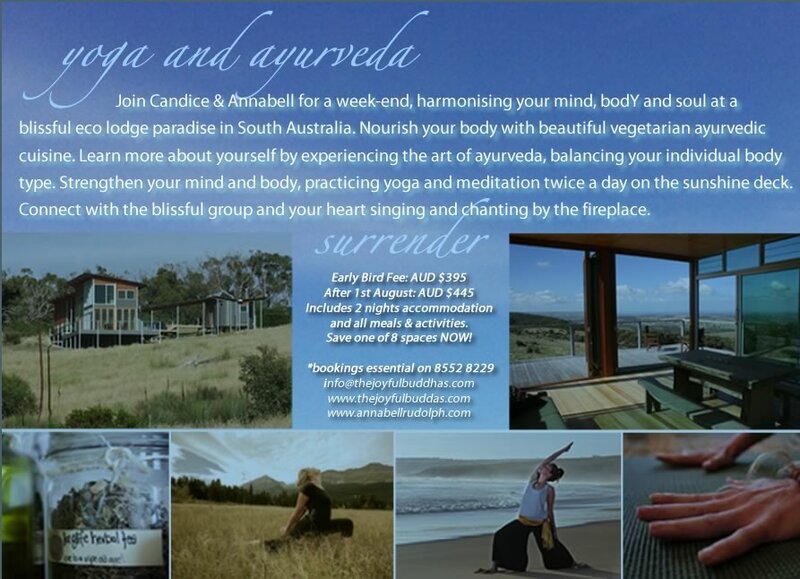 Join Candice & Annabell for a weekend, harmonising your mind, body and soul at a blissful eco lodge paradise in South Australia. 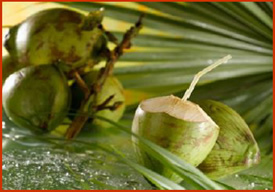 Nourish your body with beautiful vegetarian ayurvedic cuisine. Learn more about yourself by experiencing the art of ayurveda, balancing your individual body type. Strengthen your mind and body, practicing yoga and meditation twice a day on the sunshine deck. Connect with the blissful group and your heart singing and chanting by the fireplace. 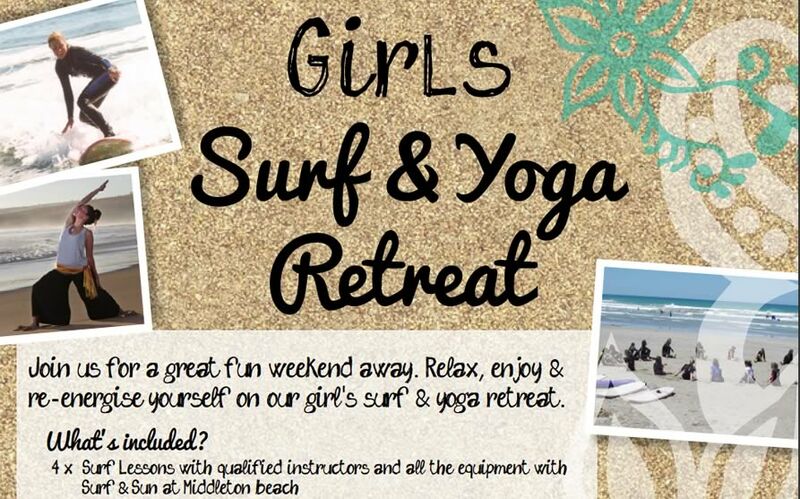 Includes 2 nights accommodation and all meals & activities. 3 days full of yoga, meditation, dance, massage, beach walks and more. Click to view all the details! Click here for Photo Gallery! "I learnt to stop looking for answers outside of myself, Thank you." "The retreat was a wonderful escape from everyday life and a perfect way to relax." "Thankyou for helping me create a lovely memory. Hope to be back for another special weekend. Thankyou to 2 very lovely ladies." "I will be recommending you to everyone i care about." eat like that! I feel lighter and energised." 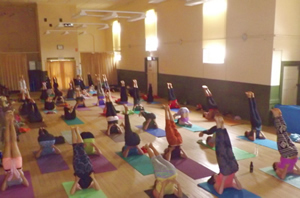 "The Yoga was great...challenging and refreshing. Beautiful." "loved my introduction to yoga. The sessions seemed to be over in no time." "I had never done experienced meditation before and i found it really powerful. I found the meditations a really special time. I found your guidance really helped me Julie."